100% WPML Multilingual Plugin and Translation Ready. Updated: Removed branding notice from one-click-demo-importer page. Fixed: is_array() error now fixed when Jetpack enabled. Fixed: nested blog comments on mobile. 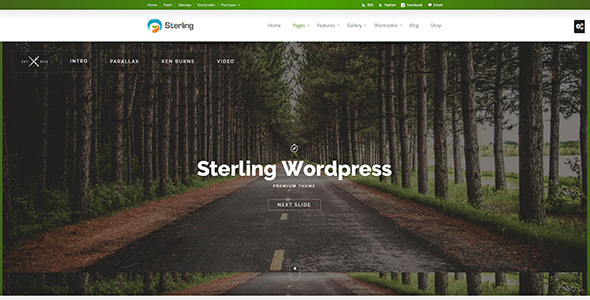 Update: Sterling has been swept clean of all code affected by recent Wordpress XSS Vulnerability. New: Add Site Option checkbox to easily enable sticky mobile menu. 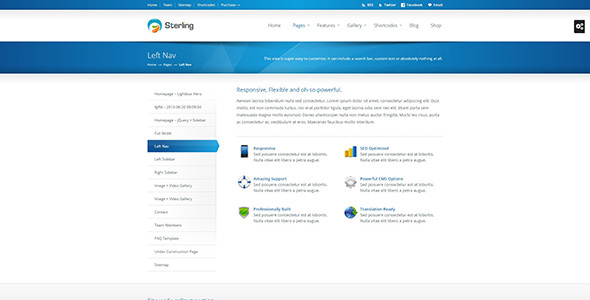 New: Site Options Panel re-designed to match Wordpress 3.8 UI. New: Ability to add a jQuery Slider to any page unlimited sliders. New: Ability to create unlimited (custom) Gallery Pages. New: (369) Font-Awesome Vector Icons Shortcode. New: Font-Awesome Vector Icon Boxes Shortcode. Improved: Greater compatibility with Google WebMaster Tools. Improved: CSS3 PIE script added to provide more CSS3 support in IE8. 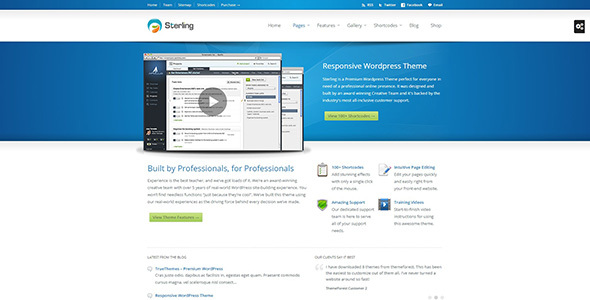 Update: Sterling's Shortcode Manager updated to be ready for Wordpress 3.9 / TinyMCE 4.0. Optimized: Alphabetically oragnized all CSS properties for quicker parsing. Optimized: Reduced filesizes and number of files used in Site Options Panel. Fixed team member photo frame bug. Fixed 'calculate shipping' button bug. Added the ability to use WordPress default avatar. Added fix for missing left and right slider buttons. Fixed success message notification css class name. Visual improvements to shortcode manager. Added Pricing Boxes to shortcodes. Added 'Jumbo' button size to shortcodes. Optimized CSS. Removed @import and combined images into single image sprite. Fixed "un-even rows" bug in Gallery sections. Update with woocommerce products width and remove bullets css fix. Update with class_exists check for Jetpack grunion contact form. Updated with checks for Jetpack plugin, show global notification in Theme activation view if detected. Update with checks for allow_url_fopen and cURL, and error message fallback. Fixed error in slide.js init code, removed quotes to boolean true. Added function to allow HTML in copyright notice. Added new site option strings, st_woocommerce_title and st_woocommerce_description. New file added for CSS3 Media Queries in web browsers > IE8. Added reference to respond.js for Internet Explorer. Removed [raw] tags for proper paragraph formatting. Updated file to latest version. Fixed Google Chrome rendering bug on FAQ template. Fixed "wrapping checkout button" bug. Replaced banner code with page slider code. All pages now have ability for custom slider. Added new metaboxes  to post and page editing screens for custom slider input. Modified button styling to match WordPress 3.5 styling. New functionality for page sliders. New script that enables you to easily install recommended plugins for this theme. Speed optimizations and bug fixes. Added code to further clean up wp_head output. Added code to further optimize TrueThemes 'comments on pages' functionality. Further optimized CSS for woocommerce. Added CSS3 Media Queries to IE8 and below. Speed Optimization for 'save settings' functionality. Added check for WooCommerce page and applied custom CSS Class accordingly. Image used on main navigation. Added new code to add arrow indicators on main nav items that contain child pages. Added CSS for arrow indicators on main nav items that contain child pages. Added new shortcodes: content boxes, email encoder, drop caps, highlight text, mono icons. Added new class name to Footer Callout Button. Updated with checkbox to allow comments on page. Updated Twitter widget to work with new Twitter API. Improved responsive-ness of Under Construction Page Template. Modified Shortcode for Notification Boxes. Added 'closeable' option to Notification Boxes. Site Options: Added new option for Slider Navigation Arrows. Site Options: Added new option for Boxed Layout. Site Options: Added new option for Body Background Color. Site Options: Added new option for Body Background Image. Site Options: Added new option for Body Background Image Position. Site Options: Added new option for Body Background Image repeat. Shortcodes: Added Facebook and Google+ to Team Members Shortcode. Shortcodes: Added Team Members to Visual Shortcode Editor. Shortcodes: Added Testimonials to Visual Shortcode Editor. Added styles for Slider Navigation Arrows. Added styles for Boxed Layout. Added closing div tag for boxed layout. Added opening div tag for boxed layout. Added conditionals for custom per-page color scheme. Added PHP check for Slider Navigation Arrows. Optimized XML strings for WPML Translation Plugin. Modified CSS for color-picker descriptive text. Added new page option for custom per-page color schemes. Added Google+ to Social Media Widget. Added Icon for WooCommerce Page. Updated Metabox script to latest version (0.9). Added CSS fixes for product review functionality. Added optimizations for WooCommerce shopping cart widget. Added fix for Child Theme update notification. Added WooCommerce conditionals. Enqueue jQuery superfish script. Added 2 new sidebars for WooCommerce pages. Added ability for custom Left Nav Menu. Added Metabox to Wordpress Page Editing screen which allows for custom Left Nav Menu. Fixed if conditional loop in comments.php to prevent sidebar from dropping off page. Loading of jQuery in html head for plugin compatibility. Improved Theme Compatibility with WPML Multilingual Plugin. 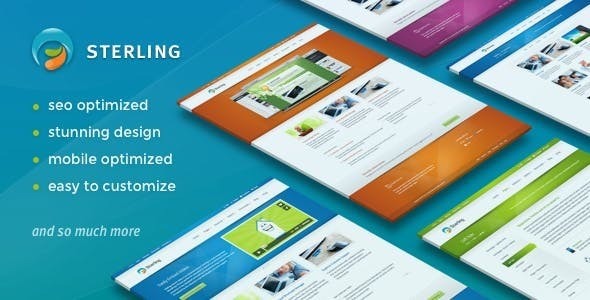 Improved Theme Compatibility with WordPress 3.4. Fixed SEO Module bug in Utility Page Templates. 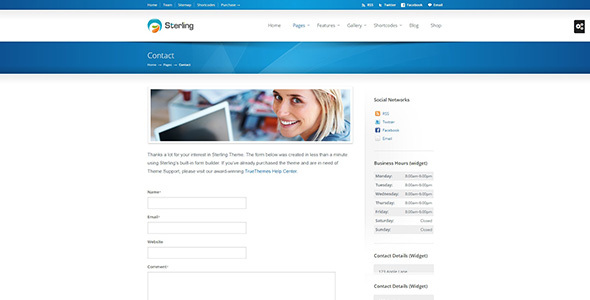 Improved Responsive function of Homepage Lightbox page template. Site Options Panel: Added ability to disable Responsive Design. Site Options Panel: Added ability to disable Searchbar on a global level. Site Options Panel: Added ability to rename breadcrumbs "Home" link. Site Options Panel: Added ability to add a Banner Description to 404 and Search Results pages. Added Localization Strings to Google Maps Widget. Added PHP/Wordpress fix for Video Transparency bug. Added HTML/PHP fix for Video Homepage Left Align. Added CSS fix for single-line divider. Added CSS fix for Wordpress "nextpage" functionality. Added CSS fix for #12 display bug on FAQ Page Template. Added CSS fix for Theme Designer Banner Settings. Added CSS fix for Tag Cloud background image. Added CSS fix for Active Main Menu Link showing on Search Results page. Removed File: "template-part-under-construction-footer.php": Functions have been added to "footer.php". Improved speed within in Admin Dashboard. Improved Footer Menu functionality. Menu will not display if nothing is set. Fixed Business Hours Widget bug. Removed background color when placed in footer. Fixed CSS bug with 3rd-level menu highlighting. Fixed bug on "Under Construction" page template. Updated Gallery Posts to allow for multiple categories. Updated Gallery Posts to allow for page linking. Improved Child Theme / Theme Designer compatibility. Fixed SEO module settings saving. Fixed saving of default settings in site options. Added suppressing of e_warning and e_notice etc when WP_DEBUG is set to true, does not suppress PHP error reporting. Minor CSS adjustments for better "responsive-ness".